Post-Yolanda, What Have We Built Back? Nestor pointed at a 15-foot coconut tree standing by the sea shore. Its leaves have fallen off and the trunk shows chipping and cuts from children trying to reach for a fruit. “Mas mataas pa dyan ‘yung alon” (The waves are higher than that tree), he recalled. The tree reminded him of November 8, 2013 when super typhoon Yolanda (international name: Haiyan) struck the islands of Visayas leaving their little town of San Jose, Tacloban in shambles. The calamity claimed over six thousand lives, displaced more than four million residents and affected 14 million people. As the storm surge hit Nestor’s house, he clung onto a fallen trunk, desperate to save his life. He muttered a little prayer: “Sana patawarin ako ng Diyos, hindi ko mailigtas ang pamilya ko ” (I hope God forgives me for not saving my family). On the same day, he lost his wife and son. A week after the tragedy, Nestor began to gather drift wood and other light materials from the shore to rebuild his house. He refused to stay in the evacuation center. “Magugutom kami doon ng pamilya ko kapag ‘di ako bumalik sa dagat. Wala akong ibang alam gawin kung hindi mangisda” (My family would starve if I don’t get back to the sea. Fishing is the only means of livelihood I know), he said. The government declared any land covered by the 40-meter no-build zone a restricted area. Nestor knew the dangers of returning to the sea, but he would rather risk the prospect of another storm surge in the future than starve today. “Sa palagay ko hindi na mauulit iyon. Isang beses lang magalit ang Diyos” (I don’t think that kind of tragedy of will happen again. God only gets this furious once), he reasoned out. Almost two years after the tragedy, many residents have taken refuge by the sea and returned to fishing and collecting seashells. According to the City Housing Office, 14,433 families living in coastal barangays in Tacloban need to be relocated, but only 1,635 families have only been relocated in temporary and permanent shelters. But even those who were transferred in temporary shelters and transitional houses could not be called completely lucky. A few kilometers from the city, the Entero family, composed of 16 adults and children, are packed inside a small nipa hut. There is no water supply or electricity in the community. Instead, they rely on water pumps and solar lights. “Masyadong masikip sa loob. Iyong mga bata nagkakasakit na dahil sa sobrang init” (It is too crowded inside. The children are getting sick from the extreme heat), Maria Entero said. But the heat was the least of the problems of residents here. What was even more alarming was the state of their nipa huts after typhoon Ruby hit them last December. The wind and rains did not spare their roof made from light materials and some dried leaves. Fear covered Maria’s face as she recalled the incident. “Parang bumalik ‘yung Yolanda. Hindi kami makalikas kasi wala naman kaming pupuntahan” (It’s as if Yolanda came back. We couldn’t evacuate because we have nowhere to go), she said. According to Dan Naputo, a City Housing Officer in Tacloban, the maximum length of stay in transitional houses should only reach two years before occupants are transferred to a permanent housing facility. But hope is dim for the victims of Yolanda as most permanent shelters under the government’s National Housing Authority (NHA) are still under construction. 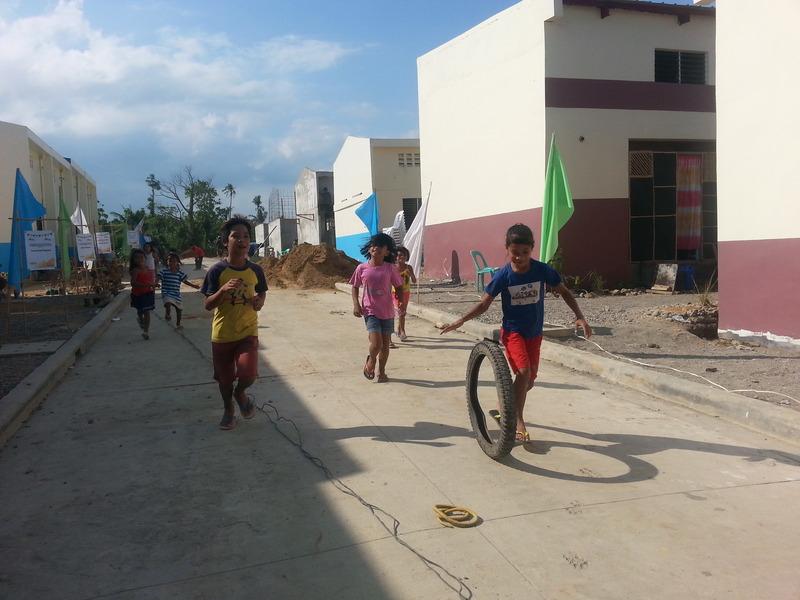 In Tacloban, for example, only one in 14 housing projects under the NHA is ready for relocation. A total of 124 families have been relocated to permanent housing constructed by non-government organizations and private companies. The situation at the national level is even more dismal. According to a report by Reuters, only 2% of the target 21,012 permanent housing has only been completed. The clamor to expedite the relocation of the displaced families prompted the United Nations to issue a statement. “Many families remain housed in collective ‘bunkhouses’ that do not meet necessary minimum standards for the provision of basic needs and services,” said Chaloka Beyani, U.N. special rapporteur on the human rights of internally-displaced persons. In a press conference in Manila, Social Welfare Secretary Corazon Soliman vowed to speed up the construction and relocation of the families. She said the government plans to complete the relocation of 70% of the families by the end of the year. Meanwhile, thousands of kilometers south of Manila, the victims wait. “Tawag nila sa amin Yolanda survivors, pero ang totoo biktima pa rin kami. Biktima pa rin kami hanggang ngayon” (They call us Yolanda survivors but the truth is, we are victims. We are still victims until today). Editor’s Note: On November 8, 2015, the second anniversary of the destruction of super typhoon Yolanda, this article was republished on the front page of The Manila Times. Hon Sophia Balod is a storyteller. She is currently a News Producer of special reports and features for Balitanghali, Saksi, and State of the Nation with Jessica Soho. She is also a media fellow of the Philippine Center for Investigative Journalism for Basic and Advanced Investigative Reporting. Journalism 2010, UP Diliman. Read more of her articles here. Nabitin ako! Pero this is a sad truth for the people in the Visayas. So basically they’ve gone back to building low quality homes in the exact same place so that there’s going to be more deaths and destruction in the coming years. Great. Reblogged this on hon sophia.